A group of 9 stayed for 5 nights. The villa is lovely and there was more than enough room for everyone. There are walls around the whole villa which is great as it gives you your own private space. The pool was brilliant and much bigger than it looks in the pictures. It’s so close to the beach where there are loads of bars and restaurants. It’s also very close to a large supermarket! Perfect place in a perfect area. We are are already planning on returning next year. Thank you, Juan. 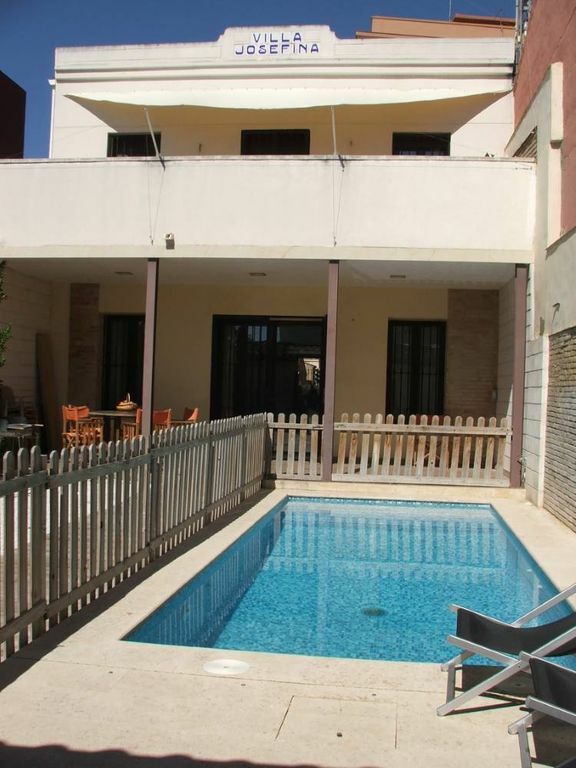 Villa Josefina is spacious, well equipped and well located for the beach and the centre of Valencia. The property matched the description and the owners, Juan and Isobel were extremely welcoming. The villa is a three minutes' walk from the beach, a long promenade, restaurants and a supermarket. The centre of Valencia can be reached by frequent buses (bus stops are also very close to the villa). We would recommend this property and we hope to stay there again. Nice villa, close to the beach! The house was more beautiful than the pictures showed! However, there can be some improvements made: the wifi connection is very slow, especially traveling with 11 instagramming girl! Also the room downstairs smelled like the previous renter. Despite this, we had an amazing time in Valencia, which is a beautiful city. The location of the villa is perfect, right at the beach, and the pool is lovely! Thanks for your comment! about the Wifi, it could be slow if there are too many people connected at the same time.... Also sorry about the issue on the lower room. It was cleaned (as always) both bed linen (in the laundry) and the whole room, and I check personally everytime, but for any reason you could feel some different smell. Nevertheless we changed all bed linen as soon you as you advised, and the issue dissapeared for the whole week. Sorry for this. Hemos estado fenomenal, la propiedad es acogedora y eso que nosotros íbamos con 7 pequeñines, el sitio es tranquilísimo y la casa nos proporcionó todas las necesidades, además nos hizo un tiempo fenomenal que nos hizo de disfrutar hasta del patio. En cantados de la amabilidad del propietario también. Quedamos muy agradecidos de lo limpia y bien que está la propiedad. "The house is lovely and everything you need is available.The beach & supermarket are just a few minutes away.We have a great time at Valencia, a very nice town." "I''ve stayed in the house with nine friends for a week and we often said to each other that it couldn''t have been better! Especially the location was great since we didn''t have a car. The beach, bus and metro, supermarket and bakery are just a few minutes away, the city center 15 minutes with public transport. The house is lovely and everything you need is available. When we were at home, we spent most of our time in the garden and we especially enjoyed our private pool! (Text automatically translated) ENJOY THE BEACH FROM THE CITY. VISIT THE MOST IMPORTANT MONUMENTS, 10 MINUTES, AND REST AS IF IN THE FIELD. A 5 MIN. PORT CIRCUIT AND FORMULA-1.